A few weeks ago, I shared 10 mistakes you can’t afford to make if you use email to prospect, so it’s only right I share with you 10 things you need to do. These are from my new book, High-Profit Prospecting, which people are raving about and I believe you will too when you read it. 1. Use email as one prospecting strategy. Email is not the only prospecting tool. Relying 100 percent on it will only result in problems arising with obstacles like email filters. 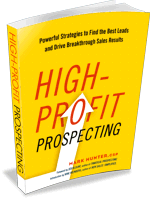 “Best practice” prospecting is when you use email as only one of the prospecting tools. 2. Write the email to be read on a smartphone. A high percentage of emails are viewed on a smartphone. So, your email must be as easy to read on a smartphone as it is to read on a laptop. It should be no more than six sentences and no more than two to three paragraphs. The prospect is less likely to read long emails and even less likely to engage with you if the email is long. 4. Include no attachments or graphics. Keep your email clean to allow it to load quickly regardless of the device being used and to give spam filters one less reason to potentially block your email. 5. Never send the same email twice to the same person. Always assume the person has read your email. Sending the same message twice is telling the customer you don’t trust them. 6. Include a compelling subject line. People are looking for a reason to delete rather than read. Failing to give them a subject line they will find of interest is inviting a high non-open rate. 7. Focus on the first one hundred characters of the email, which are extremely important. Since such a high number of emails are viewed on a smartphone, it’s important to ensure what is seen initially is as powerful as possible. 8. Never send more than three to four emails in a six-week period without receiving a response. This minimizes the likelihood of the email being tagged as spam by their email filters. The specific factors used will vary dramatically, but being banished to the spam or junk folder is not something you want to risk. 9. Do not make the email a shopping list of everything you can do. Each email you send must be focused around one specific point. Turning your email into a shopping list is putting too much in front of the lead or prospect at once. 10. Use email tracking software to monitor key emails to see if they were opened. The best email is useless if you don’t know if it’s been opened and read. For more tips on what it takes to get and keep customers, don’t miss the Customer Acquisition Symposium on Nov. 18, where I will be speaking. Gain the strategies that will boost your momentum in 2017! Great idea. Even though you compose the message on your desktop, most emails are read on phones.